Ensign John Gay of the U.S. Navy had just returned home from several months aboard the U.S.S. Constellation in the South Pacific when his phone rang. A reporter for a photography magazine was on the line, hoping to discuss the 2000 World Press Photo Awards. Gay was perplexed: “Who are you and what do you want?” he said. The reporter explained that Gay’s photo had taken first prize in the Science and Technology category, which was news to Gay: he didn’t even know he’d entered the prestigious contest. A lot had happened when Gay was at sea. But the photo held more surprises than just its global accolades. It captured a moment that was wildly misunderstood by most of the people who saw it—including the photographer. Gay had taken several pictures while on board the aircraft carrier—it was his part of his job as Photographer’s Mate, after all. But after a minute of thinking, he had a pretty good idea of which photo had captured so much attention. On July 7, 1999, the Navy Strike Fighter Squadron One Five One, assigned to the Constellation, had put on an aerial demonstration for foreign dignitaries off the coast of Pusan, South Korea. (Connie, as the ship was nicknamed, had been deployed to monitor rising tensions between North and South Korea, and would later travel to the Persian Gulf.) Gay, who mainly managed the aerial reconnaissance pods the jets used for intelligence purposes, had no recon missions at the time, so he went to the top of the bridge with his Nikon N90 to see if he could hone his technical skills and catch any of the F-18 Hornets mid-flight. As he processed the film, though, Gay realized what “that” was: a strange vapor cone had formed at the back of the jet, such that it looks like the aircraft is reentering the sky through a misty portal. Gay didn’t know it at the time, but his photo marked one of the clearest examples ever captured of a unique high-speed phenomenon. Gay scanned the photo and sent it off to the Chief of Naval Information; he thought it might be good for one of their in-house Navy publications. Then he pretty much forgot about it. He certainly didn’t foresee that Sports Illustrated and Life magazine would pick it up, or that the former would submit it to the World Press Photo Awards, where it would beat 42,000 other photos to take first prize. It would also win the National Photographers Association award later that year. In the coverage at the time, almost all the media outlets (including Sports Illustrated and World Press Photo) described the image as a physical manifestation of the breaking of the sound barrier. 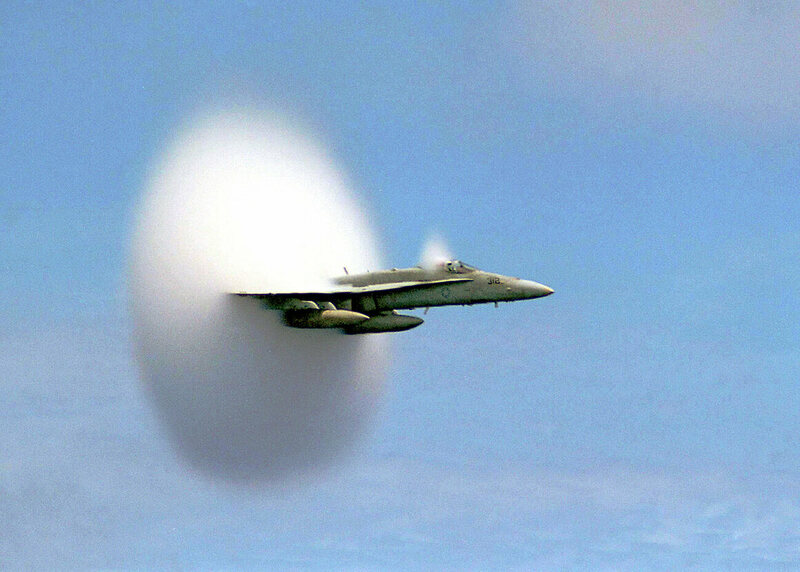 Gay seemed to believe that, telling one interviewer, “I clicked the same time I heard the boom, and I knew I had it.” Other coverage described the cone as a result of the Prandtl-Glauert Singularity, a phenomenon predicting that aerodynamic forces would approach infinity as aircraft neared the sound barrier. It turns out neither of these are correct. Instead, Gay had captured an effect known as flow-induced vaporization that sometimes forms around objects flying at high speeds in the right environmental conditions. “They are not an effect of breaking the mythical sound barrier,” according to Peter Coen, NASA’s supersonic project manager at Langley Research Center in Virginia. Coen uses the word “mythical” because, until Chuck Yeager first exceeded Mach 1 in 1947, many people thought that the sound barrier was an actual force that caused planes to crash. When pilots and ground observers later saw these vapor cones briefly enveloping high-speed jets, it was only natural they would assume it was related to this old belief. Now, though, photos like the one Gay took have allowed scientists to better understand the phenomenon, and many others have since documented flow-induced vaporization, both on jets and on rockets. Coen directed me to a booklet put out by NASA about the visualization of aircraft flow fields, which is amazingly detailed but requires more than a passing knowledge of aerodynamics to understand. So I turned to Sally Bane, an assistant professor of Aeronautics and Astronautics at Purdue, to better understand what was causing these vapor cones. It turns out that while an object needs to be going at a very high speed in order for the vapor cone to appear, there are lots of other factors required for humans to see it. First is shape: at really high speeds, waves form on aircraft bodies to direct airflow around various surfaces. Because of the F-18’s curves, when it’s flying level the air first encounters a shock wave, which increases the air pressure and temperature, then an expansion wave around the wings, which radically decreases the air pressure and temperature, and then another shock wave at the rear of the aircraft. If there’s not enough humidity in the air, you won’t actually see any of these changes. If there is, though, the water vapor will condense to form a cloud during the low pressure of the expansion wave—and then quickly disappear as it hits the second shock wave, creating the vapor cone shape that Gay captured. Gay says he’s been contacted by lots of scientists about his photo, but that he’s out of his element when it comes to aircraft flow fields and the science behind the effect he captured. Gay is now 53 and in his 28th year in the Navy, and is currently serving as the deputy public affairs officer for United States Fleet Forces Command. He’s never once gotten any money for all of the various reprints of the photo (including this one), since most government photos are in the public domain and free for anyone to use. But if he holds any resentment that his photo has gotten famous without him, he sure isn’t showing it. Update, 2/16: An earlier version of the story incorrectly named the type of camera used to take the picture.